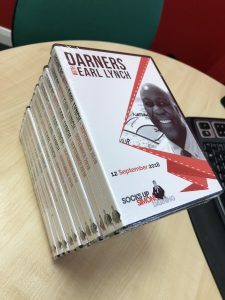 One of the benefits of being a member of Darners (My mastermind groups for accountants) is that you get a copy of the speaker’s presentation on audio (so you can listen to it in the car) and DVD (so you can share it with your team). Many members listen to the material again and again and get something new from it each time. I always recommend that you put some time in the diary straight after a training/event/conference to review your learning and actions you are going to take. The picture shows the stack of Earl Lynch DVDs/CDs about to be posted out to group one. Earl presented on up-serving and how we can help our clients make more money through helping them more. He put enthused we should be helping all our clients “make money, save money, look good and feel good”. What can you do with just one client today to help them “make money, save money, look good or feel good”? Then go do it. Earl is presenting to same material to group two on 1 November (we meet at the hotel in Peterborough the night before) and I have a place for an accountant to test drive the group. If you’d like to come along just message me and we’ll set up a chat to discuss how it works.